1. In a large saucepan, combine the potatoes, a large pinch of salt, and water to cover by 2 inches. Bring to a boil, lower the heat, and partially cover the pan. Simmer for 8 minutes, or until the potatoes are just tender. Drain into a colander and set aside. 2. Slice the rounded sides off the cucumbers to create rectangular blocks. Cut the blocks into ⅛-inch thick slices, then stack the slices and cut into even matchsticks. Cut the leek sections in half lengthwise. Slice into matchsticks. 3. Bring a large pot of salted water to a boil. Add the cucumbers and cook 1 minute. With a slotted spoon, transfer the cucumbers to the ice bath. When cool, drain and set aside. 4. Return the water to a boil. Add the onions and cook 3 minutes. Drain and rinse with cold water. When cool enough to handle, peel the onions by pinching the pointed ends to remove the skins. 5. In a large flameproof casserole over medium heat, melt the butter. Add the onions and cook, stirring occasionally, for 10 minutes, or until browned. Add the leeks, celery, salt, pepper, and paprika. Cook 5 minutes more. 6. Add the sherry and simmer, stirring occasionally, for 3 minutes, or until reduced by half. Add the stock, clam juice, water, thyme, and bay leaves. Bring to a boil, lower the heat, and partially cover the pan. Simmer for 10 minutes. Remove thyme and bay leaves. 7. 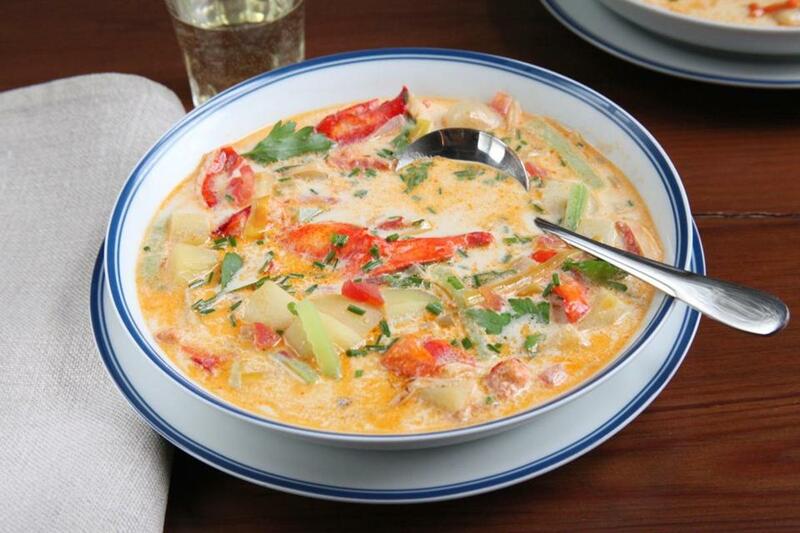 Stir in the cream, potatoes, cucumbers, and lobster. Cook for 5 minutes, or until hot. Taste for seasoning and add more salt and pepper, if you like.